A panoramic view of the Intracoastal Waterway will melt away your cares. Updated kitchen and bathrooms. Three bedroom, two bath beach cottage is surrounded on two sides with water and built on a corner canal lot looking out to the Intracoastal Waterway. One of the most outstanding views on the island! 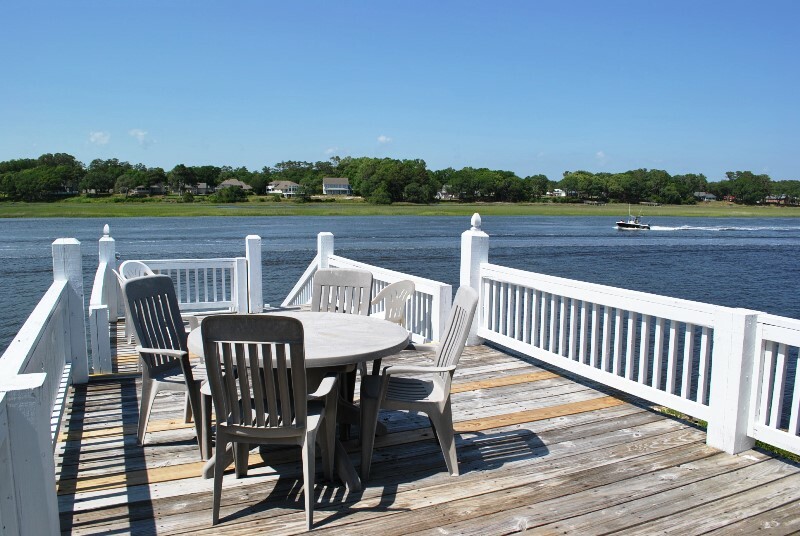 Private canal boat dock and great deck overlooking the ICW. Perfect for families and boaters! Recently renovated with new bedding and flooring throughout with great updates. New living room furniture. Fully equipped kitchen. Flat panel TV and DVD in main living room, flat panel TV in master, dishwasher, washer/dryer, microwave, covered and open decks, charcoal grill, WiFi. Linen ready property - all bed and bath linens included. Beds are made and bath towel sets provided for occupancy number. Dog friendly with additional non-refundable fee per dog. Non-Smoking. Sleeps 10. Bedding: King, 2 Queens, 2 Doubles.